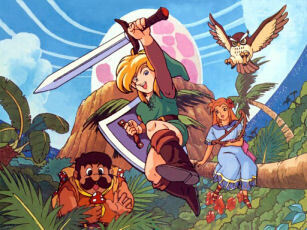 The Link’s Awakening Walkthrough has also been upgraded in several ways. All of the Heart Pieces, Seashells, Items and Bosses boxes have been upgraded with links to the specific guide they are in. The links take you to the exact section of the guide that they’re in. The biggest one is that it has been read through and contains little to no spelling/grammar errors now. A few acknowledgements, I did not do all of these guides by myself you know. Nearly a year ago, MrMosley wrote a Pieces of Heart and Secret Seashell guide for this game. It was full of text and pictures, so nearly everything on those two pages belong to him. Also, the majority of descriptions on the boss page were written by Yumil. Alder wrote the enemy guide a long time ago, remember? I couldn’t of done it without you guys. Go on our forums and thank them for me! Anyways, for the future I am done with Link’s Awakening. I have one more project in mind for it, but it won’t be published on the site itself, let’s just say that. I have already planned and confirmed my next game, but you’ll just have to wait and see what it is! I thank everyone who has given me positive comments on all of the work I’ve done, I’ve been working here ten months from today after. Have a good one.